Well when I found out about this originally, I thought finally! 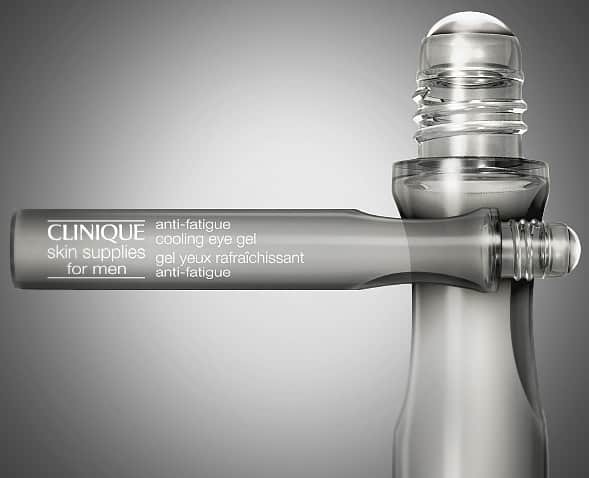 A new addition to the Skin Supplies for Men range. I’ve been a massive user of the All About Eyes Serum De-Puffing Eye Massage since it’s original launch some years back. Now as a massive computer nerd and student, I stay up rather late, leaving me with pretty dark circles, also I am very white, reeeaaally white, almost see-through; therefore, any discolouration on my face shows up very quickly, maybe you can sympathise? So, very similarly to the All About Eyes Serum rollerball, the Anti-Fatigue Cooling Eye Gel really helps to reduce darkness and puffiness. I use it underneath my All About Eyes Rich eye cream as my eyes do get really dry and very sensitive, anything with fragrance sends me swelling up like a balloon. So just tip the rollerball up and massage in circular motions from the middle of the eye – outwards. I really think that after a couple of days use, I can see a difference in my darkness and redness. The men’s version, as well as being more suited to men’s skin (our’s is around 25% thicker than that of women), dries much quicker which is very helpful for our hi-octane lifestyles, racing all our cars and playing all those manly sports (sat at my computer, mainly). I really recommend it, it’s something new to come to the men’s market and it definitely makes a difference to my tired eyes, however if you have a slight dryness as well, make sure you layer with an eye cream. It’s just £20 and available at Boots as I know it’s the same price everywhere but I like collecting my bonus points! Woop. This article first appeared on MANFACE written by Thom Watson. It was published on Saturday 13th August 2011 and was last updated on Monday 3rd April 2017 at 4:36pm. It's categorised under Clinique, Dark Circles, Eye Care, Sensitive Skin where you'll find more related content.